Testing for radon is optional, and is based on client's request. A monitor is placed in the basement and set for 48 hours, during which the air is sampled continuously. The monitor used is tamper resistant. Radon is measured in Pcl and any reading over 4.0 will require mitigation. We work closely with a professional radon test company that will perform the radon testing service upon request. We will make all of the arrangements for the testing. Building Inspectors Of WNY Inc provides structural repair services for property owners in the Buffalo, NY area. Contact us today to schedule a structural inspection and see what we can do to improve any issues with your building's foundation. 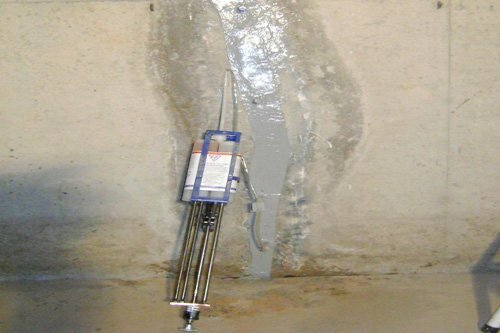 We have the resources to repair structural cracks with a special epoxy injection system that completely fills the crack void from inside the basement, eliminating the need to excavate from the exterior to repair the cracks. Typically, a single crack repair can be completed in less than 4 hours. We have the resources to install underground gutter drains and rear yard drain tiles to improve property drainage. This is typically done using 4” PVC drain pipe and ½” stone bedding with soil fabric. Trenching is done with a mini-excavator with rubber tracks to minimize the landscaping remediation. Typically, a drain line can be installed in one day. 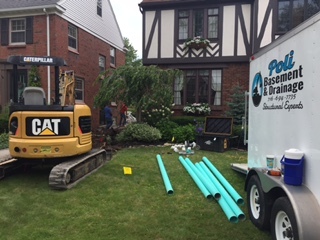 Refer to the photos for a typical gutter drain installation recently completed in Tonawanda, NY.